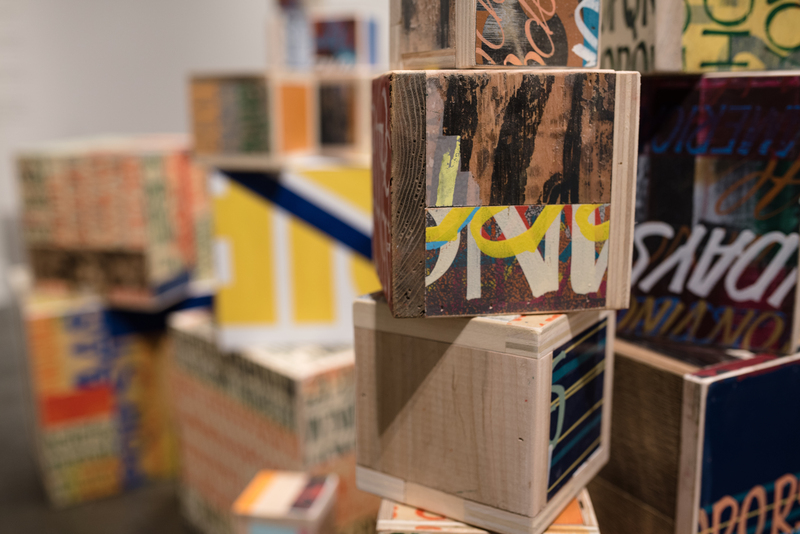 Picking up threads of the handmade in our impersonal digital era, Kenji Nakayama, Amy Sinbondit and Ben Venom utilize traditional craft techniques to construct objects that communicate in nontraditional ways: through symbols, through lettering and through gestures. 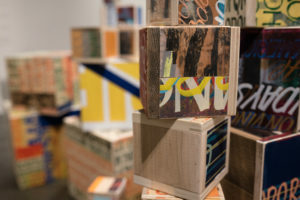 These three artists stem from different traditions, each with a long history, each with a unique vocabulary, each with a self-contained community of practice. These communities are often closed, accessible only to those who speak an almost secret dialect of ceramics, quilting or sign-painting. 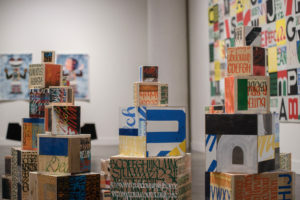 Nakayama, Sinbondit, and Venom seek to open these communities of practice by creating works that communicate not only their mastery of construction, but also embedded messages legible to those beyond the community boundaries. They demystify the secrets of their respective crafts by speaking in a variety of ways with different forms. Kenji Nakayama shouts, packing entire narratives into singular words and phrases by way of his indexical knowledge and practice of hand lettering. He communicates as much through the serifs and calligraphic flourishes of his letters as through the words his letters spell. Amy Sinbondit quietly whispers, creating intimate layers of extruded ceramic letterforms that are not quite legible. They mimic the motion of a scribble as if in three dimensions. 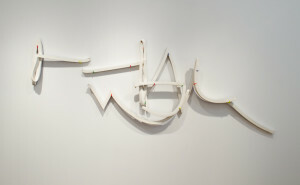 Although a hard material, the movement of her mark-making with clay dictates an immediate calm and poetic nuance. Ben Venom summons us, calling a symbolic language of tattoo, occult, biker and heavy metal imagery into being. 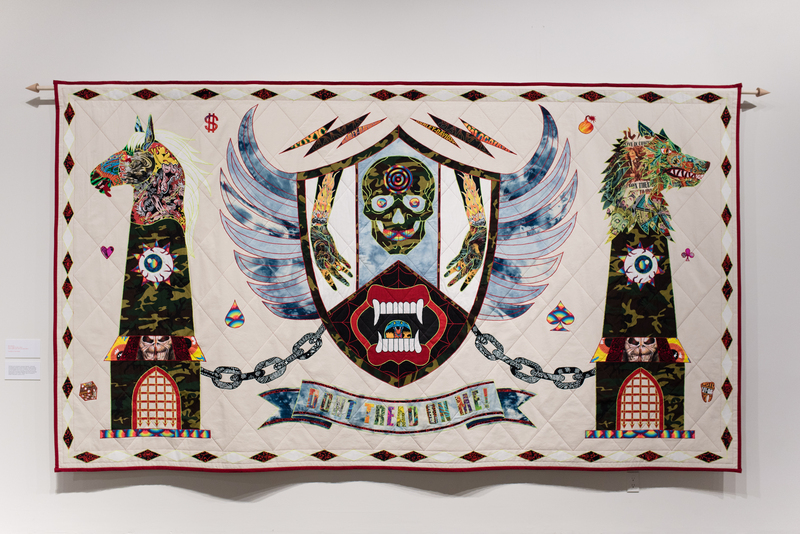 His quilts include traces of words or phrases; signposts in the symbolic narratives appliqued on recycled fabric. The material is soft, but his visual language is strong. Constructed Communication is a combination of talk and technique. Nakayama, Sinbondit and Venom reappropriate traditional craft techniques with their chosen materials, novel approaches, and contemporary dialogues. The work in this exhibition provides a counter-note to the fast-fabrication alternatives that sometimes clutter the modern world. Rather than standing in opposition, they provide alternate points of view that open new portals of understanding and use.